Oru Mexican Aparatha, C/O Saira Banu, Take Off, Dhuruvangal Pathinaaru Are Kairali TV Onam 2017 Films. They are also trying to bring malayalam dubbed version of Bogan and Thozha, These not confirmed at this moment. Take off movie will premier before onam, these films are jointly purchased by Asianet and Kairali TV. Both channels will premier the films on same day and time. Take off movie is scheduled to premier on Sunday, 20th August 2017 at 6.30 P.M. We will update onam complete program schedule of Kairali, We and kairali Arabia here very soon. Take Off Movie premier on Kairali TV – As mentioned above, this film will show before Onam. 20th August 2017 is the Date and Asianet, kairali Channels will telecast the same. Directed by Mahesh Narayan and Produced by Shebin Backer/Anto Joseph under the banner Rajesh Pillai Films/Anto Joseph Film Company. Take off starring Parvathy, Kunchacko Boban, Fahadh Faasil, Divyaprabha, Prakash Belawadi, Asif Ali, Anjali Aneesh Upasana, Prem Prakash, Rukhsar Rehman etc. Oru Mexican Aparatha movie satellite rights jointly purchased by Asianet and Kairali TV. This is one of the films in Kairali TV Onam 2017 list. This film may be premier on uthradam day, telecast date not finalized yet. Oru Mexican Aparatha directed by Tom Emmatty, it stars Tovino Thomas, Roopesh Peethambaran, Neeraj Madhav etc in lead roles. C/O Saira Banu is another films for Kairali, we can watch the premier during onam 2017. C/O Saira Banu is directed by Antony Sony and written by RJ Shaan. Manju Warrier, Shane Nigam, Amala Akkineni, Niranjana Anoop, Raghavan, Sujith Sankar, Jagadeesh, Ganesh Kumar, P. Balachandran are in the star cast. 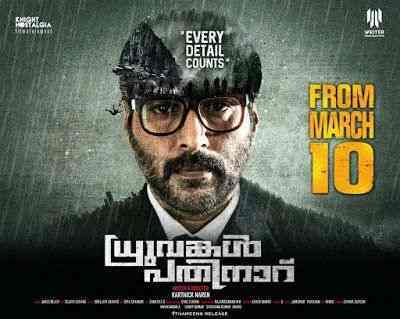 Dhuruvangal Pathinaaru malayalam dubbed version is another highlight of Kairali for Onam 2017. D-16, is a crime thriller film written and directed by Karthick Naren. Rahman, Prakash Vijayaraghavan, Anjana Jayaprakash, Karthikeyan, Ashwin Kumar etc are in the star cast of this film.